As a rule, people who have bought Chinese overlock, come home, very happy with purchase. But completely forget what was in the place of sale. Begins the long process of studying the filling thread overlock. The scheme is available, but it is usually something is unclear. How to fill serger? The filling threads start with the left looper. In the hole of the protective cover, through the thread guide (2) thread guide and into the hole (4) sliding the left cover (3). Pass the thread through the hole (4) further in the hole (5) of the plate mechanism thread tension. Next, the thread is encircled around the mechanism of regulation of tension and is passed through the channel that leads to the mechanism of loopers. Rotate the pulley until the right looper does not rise up above the needle plate. The mechanism of loopers must take the position as shown. Draw the thread behind the lever, which is fixed to the right looper, and fling it over the hook (7). Rotate the pulley until, until the left looper will not take the extreme position. Pass the thread through the looper hole (8). Next, rotate the pulley until until the right looper does not rise above the needle plate and will not bring the left looper thread to the top, where it can tuck under the foot. If the thread is incorrectly made, it will be constantly tear. Proceed to the gas station right periodically. Guide the thread through the hole of the plate of the tension mechanism needle thread. 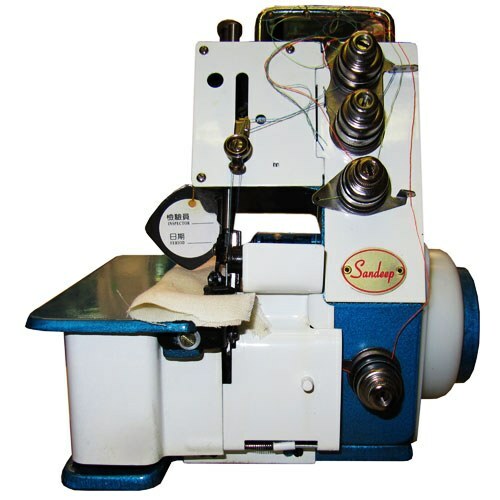 Then the thread pass through the hole of the bounding plates of the upper knife mechanism thread tension right looper. Rotate the pulley to the right looper was in the top position. Slide the thread into its hole from the middle of the thread take-up under the hooks in, where the thread goes. And last: tuck the needle thread. Pass the thread through the mechanism for adjusting the tension passing through the hole of the plate around the axis of the regulator. Then pass the thread under the hook and thread through the eye of a needle. The correctness of the process of the filling threads is checked by the seam. If the filaments are broken, the strands tucked wrong, and then wrong make a loop.